While EPDM roofing has been a popular choice for low-slope commercial roofing, we recommend a roof coating system because they are seamless and highly reflective. What is the Advantage of a Seamless Roof? Seamless roofs provide excellent waterproofing capabilities. Roof coatings are spray applied across your entire roof surface, including difficult areas such as HVAC equipment, pipes, drains and other hard to reach and seal areas. These seamless membranes have no regions that need patching or sealing, creating a very durable, uniform surface that has excellent strength and flexibility. EPDM roofing systems are applied in one of three ways: ballasted, mechanically attached or full adhered. The EPDM comes in rolls of varying widths that need to be adhered together at the seams. The more seams there are, the larger the risk of error is during installation at these joints. Seams begin failing, ripping and tearing due to improper installation, erosion and membrane shrinkage. Seam failure is also the number one causes of roof deterioration that an EPDM roof experiences because these seams provide an excellent avenue for water to penetrate the roof deck and seep inside the building. Do I Care about High Reflectivity? What to if You Currently Have an EPDM Roof? 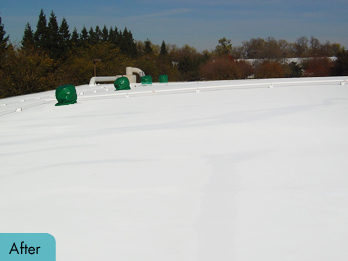 We have an excellent EPDM roof coating system that can fully restore and renew your EPDM roof into a white, highly reflective, seamless roof without worrying about a costly tear-off or any disruptions to your work environment during installation. Click here to learn more about restoring your EPDM roof! For more information on our roof coating systems, download our full line brochure or contact a roof coating professional, today 800-423-9557! Using an EPDM roof coating system allows you to fully restore your leaking EPDM roof while avoiding a timely and costly roof tear-off. EPDM roofs often begin aging or failing because they experience rips and tears along the seams. 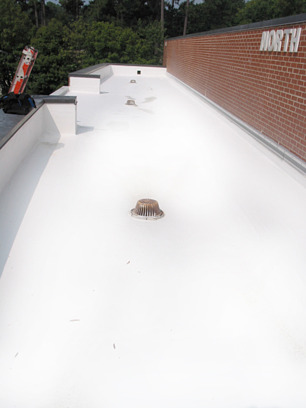 When installed, EPDM is ballasted, mechanically attached or fully adhered to the roof. Shrinkage occurs to the EPDM as the oils of the substrate dry out, causing the EPDM to become less flexible, less durable and unable to expand and contract as easily with different temperature fluctuations. The shrinkage results in seam failure as the membrane tears away from the adhered substrate - eventually leading to leaks in your building. Luckily, this can be easily restored to a brand new roof without business disruptions or closures. The AcryShield EPDM roof coating systems are ideal for proving excellent waterproofing, superior durability and protection, and reduced maintenance costs while extending the life span of the roof. The EPDM roof coating system typically uses the AcryShield A502 base coat. This base coat was specifically formulated to adhere DIRECTLY to EPDM without the need for additional primers or etching rinses. (For more, download our FREE guide on Restoring EPDM Roofs.) This coating saves installation cost and time as this labor intensive and time consuming stage is removed from the process altogether. Contractor’s benefit from offering a system with less labor and increased profits and building owners benefit from preserving their original roof to new without any landfill fee’s or business disruptions or closures. The AcryShield EPDM roof coating system can use a range of top coats that provide benefits ranging from ultra-high UV ray protection (AcryShield A590), to extra durable, extra tough for added protection against foot traffic and physical abuse (AcryShield A550), to an industry standard coating with low temperature flexibly, ratings that’s exceed ASTM D6083 requirements and high performance fire retardants (AcryShield A500). The AcryShield topcoat line has an EPDM roof coating to meet the individual needs of your particular roof. After all, these systems are spray-applied directly on top of your existing roofing, creating a seamless, monolithic, custom installed EPDM roof coating system that can be renewed and maintained indefinitely. For more information on our EPDM roof coating systems – download our FREE Single-Ply Brochure or contact us! For more, read our blog – EPDM Roofing…Answers to your Questions! The 106 SQ mechanically fastened EPDM roof was beginning to show its age after years of heat, sunlight and rain. 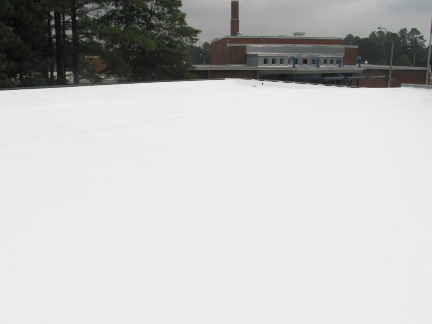 Rather than replace the roof, the facility manager at the school decided to restore the roof using acrylic coatings. The project called for the use of the National Coatings Corporation AcryShield Roof Maintenance System (ARM) using the AcryShield A502 primer and A500 reflective topcoat system. This coating system is unique in the roof coating industry as it is not only waterborne, but also does not require a corrosive primer that is normally used to achieve adequate adhesion to EPDM. The project called for reinforcing the seams and applying >24 mils of coating. An additional benefit of the white reflective coating is the increase in solar reflectance and corresponding reduction in heat gain and air conditioning energy costs. 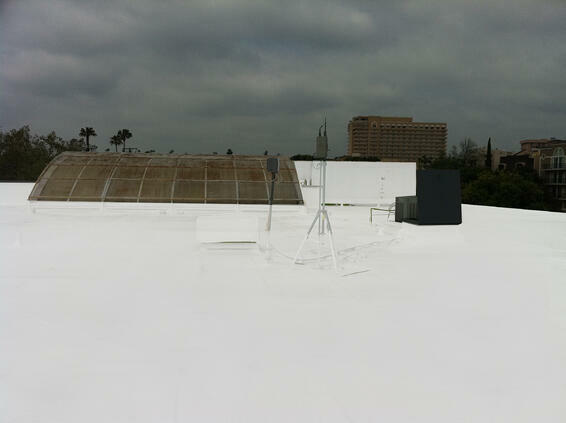 Typically a black EPDM roof has about 10% reflectance, while coating it increases the reflectance to 83%. Simply stated, the higher the solar reflectance, the cooler the roof, the cooler the interior and the less air conditioning that is required. Baker Restoration, a division of Baker Roofing in Raleigh NC, was selected to install the National Coatings Corporation roof coating system. Jimmy Ramirez, Manager, Specialty Coatings, for Baker Roofing oversaw the project. He noted during the post installation warranty inspection that the National Coatings Corporation roof coatings sprayed very well and he was particularly impressed with the adhesion of the A502 primer. Normally Baker will check adhesion of the primer prior to application of the top coating. He checked the adhesion and found it to be excellent.